When school is out, science camp is in! Want us to come to your area? Let us know! We’ll set up shop in your community for a day (a week, or a month, or whenever school is out) and bring a robust STEAM education program for families seeking a quality out-of-school experience. Collaborate with Science Center staff to provide topics and themes to inform, engage, and entertain budding scientists. Contact Justin.Magaw@louisvilleky.gov for pricing and scheduling options for grades K-8. See individual camp descriptions for times, locations, costs, and frequently asked questions. Put your imagination to the test as you build, design, and engineer using these favorite construction tools – LEGOS®! • Drop-off and Pick-up take place in front of the school. • Lunch is not provided. Your camper will need a lunch and a few snacks for the day. • Campers are required to have a completed Health and Permission form for drop-off for Monday morning registration. • Your camper will receive a camp t-shirt on Monday morning – we ask that they wear it for every day of camp. • We will be going outside for recess: bring water, hat, and sunscreen at your discretion. Explore, through experimentation and simulation what nature has to offer. Venture into the world of “animation creation”. Venture into the world of “animation creation”. Design from the ground up and learn each and every step involved, from basic sketches and story boarding to computer programming. Check in and check out will take place at the front entrance of OMSH. Lunch is provided on everyday except Monday. Campers are required to have a completed Health and Permission form for drop-off for Monday morning registration. Each camper will receive a camp shirt at the beginning of the week, please wear this camp shirt everyday to camp. We will be going to the Smother Park for recess, feel free to pack a hat or sunscreen and an extra bottle of water. Parents must have photo ID to pick up camper. Explore, through experimentation and simulation, the most dangerous phenomena that nature has to offer! Students will explore, through experimentation and simulation, the most dangerous phenomena that nature has to offer; the students will learn about their causes, their prevention, and how we have adapted to them. Zooming coasters and whiling wheels, investigate that physics behind some science defying amusement park rides. Join the quest to discover interstellar fighter planes, droids, and more! Do. Or do not. There is no try. The science and technology you see in the movies has its roots in the real world. Join the quest to discover interstellar fighter planes, droids, and more! Explore the natural world around us and build robotic animals to live in it. Engineer a story line with animation and code! Explore the natural world around us and build robotic animals to live in it. Finish the week out by designing and constructing a zoo with moving LEGO® robots. Explore the gross part of science as we learn all about the human body. Explore the gross part of science as we learn all about the human body. Discover why blood is so important and why even boogers and snot are crucial for a healthy body. 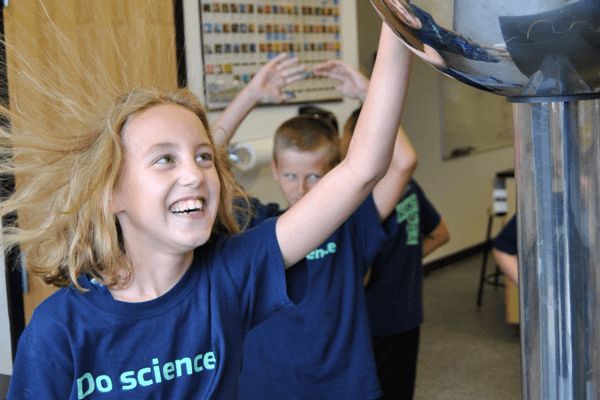 Explore the wonders in this chemistry inspired camp! Pop, fizz, bang! Explore the wonders in this chemistry inspired camp! Test different mixtures and see how they react and create a mixture of your own to take home. Challenge each myth to see if they can be busted! You have heard them all, but do you really believe all those myths? Can you walk on egg shells? Are there more germs on your toothbrush than in your toilet? Challenge each myth to see if they can be busted! Create your own clays, have fun with “Shrinky Dinks”, and discover how chemical reactions can be helpful or harmful to works of art. Be inspired by ancient art and dive into the world of atoms and molecules as we explore the basics of chemistry to create amazing works of art. Create your own clays, have fun with “Shrinky Dinks”, and discover how chemical reactions can be helpful or harmful to works of art. Zooming coasters and whiling wheels, investigate that physics behind some science defying amusement park rides! Discover why blood is so important and why even boogers and snot are crucial for a healthy body.